Bouncer's first began blending in 2011. What first became initial trials, turned into a full 6 month research and development process culminating into Bouncer's providing it's first wax '22' under the Dodo Juice Independent Wax Label. Licensed and marketed by Dodo Juice, this wax quickly reached a European and Global audience. With magazine features in local UK car performance magazines, it was taken up and used by professionals and users alike. '22' was also placed into the 2012 Wax product of the year nominations. 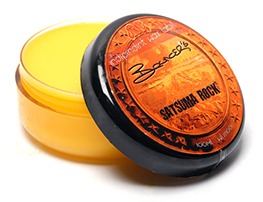 An introduction of a second wax, again under the Dodo Juice IWL umbrella 'Satsuma Rock' was launched at the end of 2012. - A very high performing product offering extended durability, ease of use and sensational fragrance. Again a winner across the globe and still today a very much in demand wax. Both '22' and Satsuma Rock can be obtained via authorised Dodo Juice resellers. During 2012 Bouncer's marketed its own first wax, 'Sherbet Fizz'. A high content carnauba wax, with slight polymer ingredients making it a great purpose all-rounder. The first Bouncer's product to be given the unique and now famous 'Fizz' fragrance which now appears in the ph7 wax safe Shampoo 'Slick Mick' and the award nominated Quick Detailer 'Done & Dusted. Vanilla Ice soon followed. This again is a high specification blend, high carnauba grade T1 content with specialist vanilla extract oils. Offering that superb 'warm glow' finish that is determined amongst many professionals and another wax that was placed onto the 2013 Wax product of the year nominations. A wax that many users prefer to use due to its outstanding water beading and sheeting capabilities. Through 2013 'Capture the Rapture' Show & Concourse wax was launched. After many months in research & development the blend was finally ready to be launched. Offering the upmost in gloss looks and refinement, it has been used on many a show winning car across the concourse and Show & Shine events across UK and Europe. A less durable wax but 'Capture the Rapture' is all about the looks. 2013 also saw the launch of 'Fortify'. A wax that offers the best in protection against the winter elements. Tested against contaminants, road salts and the worst the winter has to offer, you'll be safe in the knowledge that you have 'Fortify' to protect your paintwork. In 2014 a wax that we had been working on for a very long time was signed off. 'Check the Fleck' is a combination of high refractive ingredients that provide an instant visible 'fleck pop' to Metallic/Polychromatic and Candy Flip paintwork. High on the refractive index scale it provides almost a mirror finish to your paintwork. 2015 saw the main launch of our Quick Detailer 'Done & Dusted and our ph7 neutral Shampoo 'Slick Mick' . A soft launch of the QD in September 2014 soon showed its potential. Many customers swearing by its use and overall looks, propelling it into Quick Detailer product of the year nominations for 2014. 2016 Brings the launch of our long awaited Glass Sealant. In R&D since 2012 it has been a painstaking task to get this product where it ticks all the 'Bouncer's' boxes. Supplied in kit form, it really is a product to have in your armoury. Combine this with our new Glass Cleaner 'Look Sharp' and you really will have a clear lookout as well as improved safety whilst driving in poor weather conditions. Each and every blend is specific and unique to Bouncer's. Handblended and handpoured in the UK with extreme quality control into every product. Bouncer's offer high performance, premium products to the most demanding individual markets across the UK, Europe, Asia and the U.S.A.
Research and development is an on-going structure and principle of our business. Further products will be launched but absolute not until they have 'ticked' all the Bouncer's tough product requirements and have undergone extensive 'real life' tests. We would like to thank all of our customers/resellers and users alike who have supported Bouncer's to where we are today.